Brew loose leaf tea on the go with this easy-to-use 100-Percent BPA Free Tea Traveler®. Mug, infuser and lid screw together to make brewing and cleaning a snap. Keeps tea hot and hands cool. 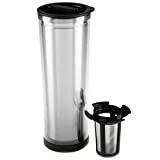 Tea Traveler® includes: 12.85-ounce 100-Percent BPA Free plastic tea mug, stainless steel screw-on tea strainer and water tight lid. Tea never traveled so well. Complete brewing and care instructions included. Sleek Clear Design Makes Brewing Loose Leaf Tea Cool and Convenient. Bring a bit of beauty wherever you go with this Cherry Blossom design. 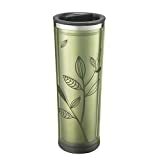 12 oz plastic tea tumbler. Unique design! 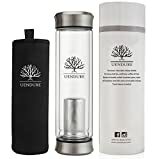 Designed to be 100-percent leak-proof, this vacuum-insulated 16-ounce Contigo travel tumbler lets you take beverages on-the-go without the risks of a messy spill. The patented AUTOSEAL lid is what makes the mug leak-proof and spill-proof, yet it also makes drinking easy. A contoured body and a soft rubbery grip at the top make this mug easy to hold. This sleek, elegant design also fits most car cup holders. This version comes in green, and it's available in an assortment of colors. The 100 percent spill- and leak-proof AUTOSEAL lid automatically seals between sips, making it impossible to spill. There's no lid to remove or spout to open, so it's great for one-handed, on-the-go drinking--whether commuting, hiking, or just dealing with a busy day. Simply press the button to drink and then release to seal between sips. And because the lid system is always closed unless activated, your beverages will remain hotter and colder for longer periods of time. 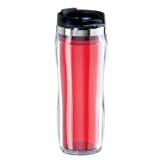 Made from durable stainless steel, the mug has a double wall and is vacuum-insulated, ensuring that hot beverages stay hot and cool beverages stay cool. Vacuum-insulated technology keeps beverages hot for up to four 4 and cold for up to 12 hours. The double wall construction not only retains temperature, but also prevents external condensation from forming so table tops are free from moisture. It measures 2-1/2 inches round by 8 inches tall, and it weighs approximately 8 ounces. 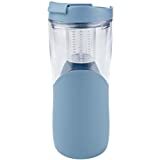 By using this Contigo product, you're both helping the environment and also saving money by taking your water, coffee, tea, or juices on the road in a reusable container instead of buying water bottles on the go. And research shows that coffee drinkers can save nearly 23 pounds of paper cup waste by toting around their own reusable mug. 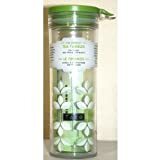 Caring for Your Contigo For easy care, the Contigo lid is top rack dishwasher safe. It is recommended to hand wash the mug body to protect the finish. Always store with lid removed to prevent moisture from becoming trapped in the body or lid after washing. Do not keep liquids that spoil easily, such as dairy, in the mug for prolonged periods. For use with hot or cold beverages. About Contigo Knowing that on-the-go beverages can be messy and complicated to use, Contigo developed a line of simple, yet functionally innovative drinkware to help people face life's daily challenges. The products are dapper, yet resilient; sleek yet strong--the splendid combination of performance and grace. Contigo products give you the confidence you need to face the day and pride in knowing that you bought the best of the best. Contigo is passionate about the products they create and believes you will be pleasantly surprised by the array of helpful innovations it offers.